I first became infatuated with Smithie' upon learning of some of his brief exploits in Bill Bryson's excellent In a Sunburned Country travel narrative book that I listened to Wayback in January, 2017. Having been read by the author himself on the CD Audiobook version I'd corralled from my local library. Where Susan & Ruth, the main library assistants keep me constantly well supplied with excellent reading; err listening recommendations. Interestingly, the book describes how two other Australian World War One "Flyboys" (pilots) named Paul McGinness and Hudson Fish, with the backing of another Aussie named Fergus McMaster, found sizeable funding for their venture called Queensland And Northern Territory Ariel Services Ltd in late 1920, better known today by its acronysm QANTAS, now the third oldest Airline. But in what seems to be a reoccurring theme in the book, partnerships were formed and then their respective personalities got in the way over all types of matters. Since it's definitely not a new phenomenon, it's interesting nonetheless how man's desires to accomplish his Dreams apparently involves Shunting your Mate! As McGinness couldn't stomach Fish's relentless push towards professionalism and "flying by the Book" literally. As Qantas was the first Airline to mandate All of its Pilot use a Flight Checklist, which McGinness was opposed to, and soon left the burgeoning Qantas operation. another example involved Smithies' best Mate Keith Anderson and Kingsford-Smith, with Thar first difficulty involving what else, a woman! Who would eventually become Anderson's wife. And then although it had originally been Kingsford Smith & Anderson's Dream to be the first to fly across the Pacific following their flying days during World War One, Anderson was ultimately "Grounded;"Err Kicked Kerbside, as another flying chum named Charles Ulm took his place aboard the 'Ol bus, their Aeroplane appropriately named the Southern Cross. Yet whilst listening to the book intensely, a whole weird sense of Deja Vudu set over Mwah upon hearing Richard Aspel, the book's narrator's voice say the word Kookaburra! As it was creepy already knowing the fate of the two men who irrationally set off to find Thar lost Mates in what was dubbed "the Coffee Royal" incident. After having learned 'bout their Fates in Bill Bryson's book. As Anderson and Mechanic Bobby Hitchcock had been the original other half of the Quartet planning upon flying the Fokker Tri-motor across the Pacific Ocean. Even more Karmic yet, is that Anderson was given the money to buy this temperamental light Aeroplane after settling his lawsuit against Kingsford Smith and Ulm, after having left the party from San Francisco before the successful flight of the Southern Cross. Hitchcock however wasn't as fortunate in his lawsuit for the Writ of $1,000 pounds which Smithie had promised him in a drunken stupor. Meanwhile, Bon Hilx pleaded for her fiancé Keith anderson not to make this hurried, rushed flight! As the Aeroplane wasn't properly sorted, as a portent of things to come showed it's hand as Hitchcock sat transfixed watching a locknut work itself loose on the engine during the first leg of their trip to Alice Springs. On April 10, 1929, the pair departed to make the final half distance's travel to where Anderson was certain the Southern Cross lay stranded, and decided to take a calculated risk to carve precious hours of travel by crossing the inhospitable Tanami desert. Yet the two men were ill-prepared for the Harshness of the Tanami Desert, especially lacking adequate amounts of water, for which the Duo perished after being unable to clear a path for the previously stricken aircraft, for which it's uncooperative pushrod had been fixed. Upon Smithie, Ulm & Co. having successfully made the first Trans Pacific flight from Oakland-Hawaii-Fiji-Brisbane in just over 93hrs flying time! Ninety years ago this summer. Not only was Charles Ulm overshadowed by Kingsford-Smith, but even more so were the two Yanks' making up their replacement crew. With Navigator & Engineer Capt. Harry Lyon and Radio Operator James Warner. Afterwards Kingsford-Smith completes his quest to become the first Aviator to circumnavigate the world around the Equator in 1930. With Smithie also becoming the first to cross the Atlantic from east to west, albeit a very difficult undertaking due to the ferocity of opposing air currents which were unknown at that time. And upon completing this leg of his journey, he meets Charles Lindbergh in New York, where the two aviators have a brief visit before Smithie completes his task of flying his 'Ol Bus the journey's remaining leg to San Francisco's Oakland airport, where he began his round the world pursuit over two years earlier. And whilst Smithie accomplished more feats in the following years, it was Bill Bryson's mentioning of this famous Aviator flying over Sydney after taking off from the Harbour which launched my Quest to find something substantial upon this unknown Flyboy. alas, on July 17, 1934 - Smithie and Sir Gordon Taylor, who flew as co-pilot & Navigator with Kingsford-Smith on more than one occasion; flew the Lady Southern Cross out of Sydney Harbour to Mascot Aerodrome. But were required to cover the word Anzac' Smithie had plastered upon the plane's fuselage before taking off. Thus I subsequently learned that Anzac' is (Digger'_ Slang used for members of the Australian military during 4 wars: World War One, World War Two, Korea and Vietnam. This also led me to discovering that the totally unknown racecar driver Norman Leslie "Wizard" Smith, known as Australia's fastest motor racing driver who Set multiple Speed Records also raced with the word Anzac on his car. As the subsequently renamed Lady Southern Cross would be the last Aeroplane that Smithie ever flew, after he and his fated co-pilot (and devoted Mechanic) Tommy Pethybridge Disappeared somewhere over the Andaman Sea in the Fall of 1935 when attempting to break the current England to Australia Speed record. The book weighs in at a hefty 679 pages, or 22 CD Discs. 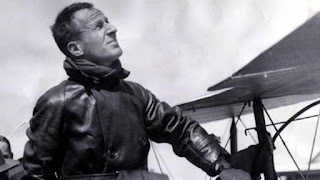 and while it's main character is the beloved Smithie', aka sir Charles Kingsford-Smith, the book also chronicles the growth of Australian aviation and the pioneering spirits Down Under - Who helped Aeroplane flying going from that first wobbly flight at Kitty hawk in 1903 to ultimately Man stepping upon the Moon on July 25, 1969, just 66 years later! Some but not all of the persons touched upon in the book include Octave Chanute, who I knew of this pioneer aviator from reading David McCullough's wonderful book The Wright Brothers. As my only minor critique of the entire book is that the author definitely took literary liberties with the exact event of orders with the Wright Brothers to my memory. Others include Lawrence Hardgrave, who pioneered the concept of not only curved wings but the rotary engine. Bert Hinkler, Harry Hawker, Lawrence of Arabia, Sir Rob Smith and his brother Keith, winners of the 1919 England to Australia Air race. Along with discussing briefly the 1934 Mac Robertson Trophy Air Race celebrating Melbourne's Centenary, for which Smithie just had to win! Which inevitably led to his purchasing of the Lockheed Altair, which finally became the Lady Southern Cross after his unapprobved modifications, mostly adding extra internal fuel tanks for which he wasn't granted FAA Certification for, with the subsequent, constant modifications causing him to ultimately fail to contest this most coveted Air race. Also, the book briefly mentions Harry Houdini, for whom I had zero clue had taken flying lessons, since it was A-L-L the rage and he wanted to become the first person to successfully fly in Australia, which he proclaims to have done in March, 1910. AVIATION: How Much do you Know about Charles Lindbergh? and last but not least, that other Charles, aka "Lucky Lindy," aka Charles Lindbergh, who I'd just learned somewhat about prior from a previous book titled: Those Angry Days - Roosevelt, Lindbergh and America's Fight over World War II 1939-41. When, as the book's title implies, the famed aviator led the charge of Anti War and Isolationism between 1939-41, prior to Pearl Harbour, for which Lindbergh was more famous than FDR!